This card is an unusual one for me - there isn't any Cricut involved! 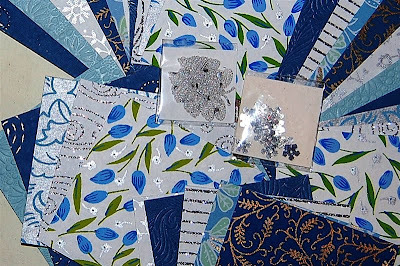 I bought these beautiful handmade papers a couple of years ago when we visited our son in San Francisco. I hadn't used any of them yet - too pretty! I decided to make a quick card using one small piece. 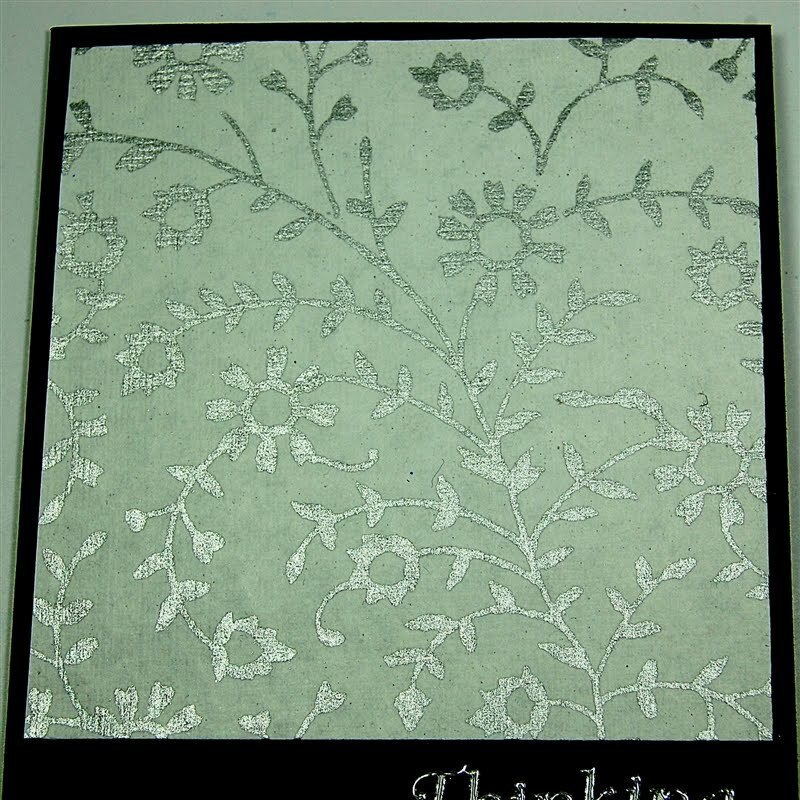 Since I just recently did Mandy's Scrappy-Go-Lucky card swap/blog hop with the black white and silver scheme I was attracted to this silver and white paper which I placed on a black A2 card base. 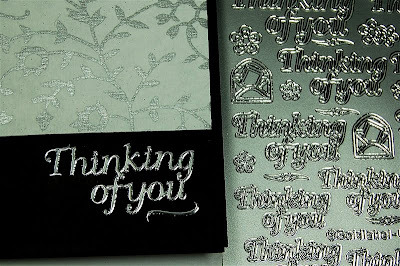 The silver sentiment was from a sheet of "peel-offs" that my friend Agnes from Scotland sent me a while ago. 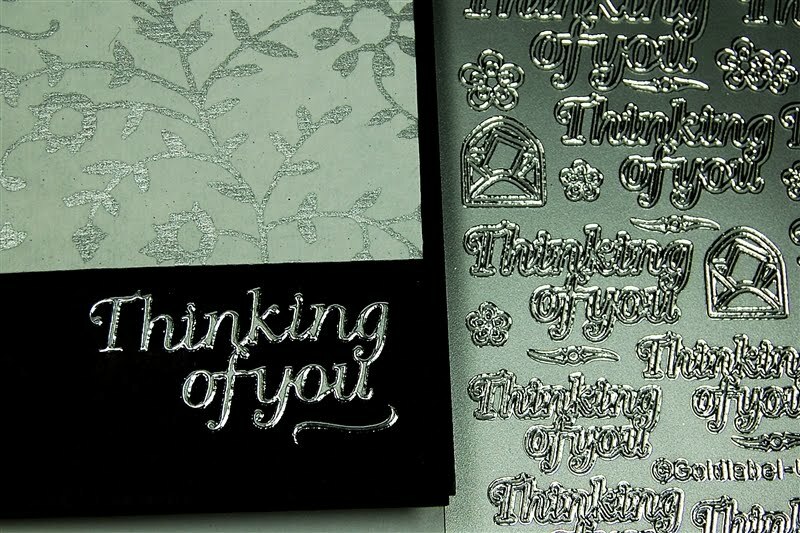 These are fun to use for a change from stamps or Cricut cut sentiments. I added Creative Charms Pure Blossoms jewels in two shades of pink on top of the silver flowers. I used Glue Dots to attach the flowers. 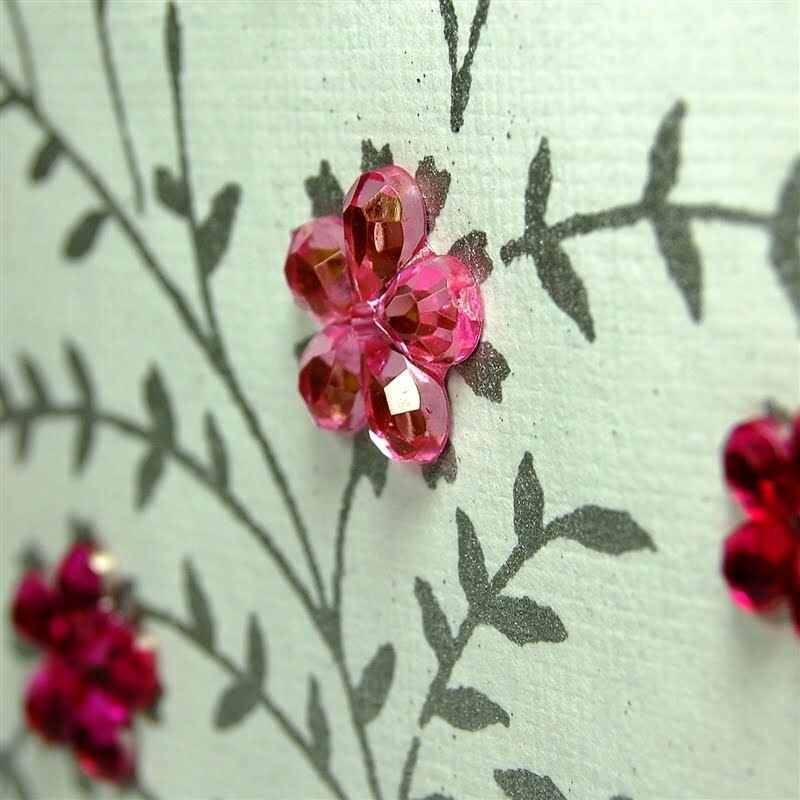 Beautiful paper, a shiny sentiment and the sparkly gems make a simple, pretty card to send to a friend. Beautiful papers! I can see why you hesitated using them, but the card is very pretty. Thanks. I love this card and the paper is so great. I also /ike the silver words. I have been recycling my old Christmas cards and making new ones. I would love to have you look at them. Please leave me a comment. I look at your blog alot and have recieved e-mails from you. Thanks for all you help. That card is stunning. I always love your creations but today's took my breath away. Thank you. 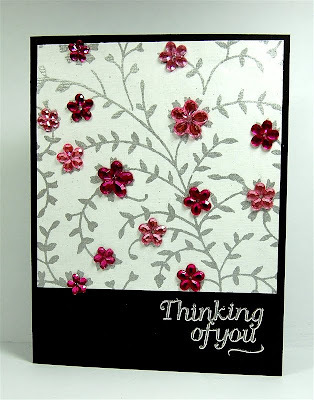 Your card turned is just gorgeous!! 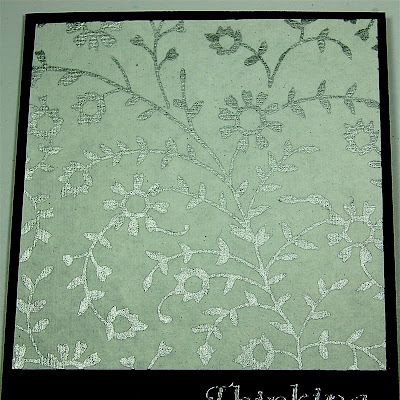 This card is absolutely stunning -- of course, I've also been in the black, white, and silver mode while following the blog of beautiful creativity last week. 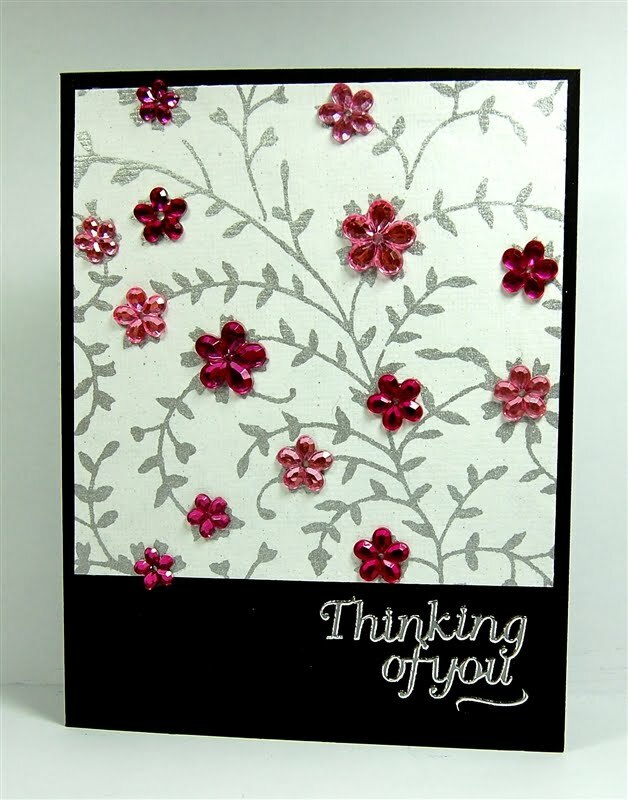 Adding the two shades of pink for the bling is the additional WOW factor -- I am in love with this card! What a simple and beautiful card. I love the way you added "bling" to it. Stunning papers. Made such a gorgeous card. Gems were a great finishing touch. TFS. Diane you're just AMAZING. This card is so pretty. I love it all. I think I'll make one tonight. Thank you so much for sharing your beautiful work. Have a great weekend. Thanks for visiting my Blog Site and your kind comments. I love to visit you blog and see your cards and hear your stories about your family. Did I send you my family Web Page address. I do one every month. I think you might enjoy it. E-mail me if you would like to have the address. All I can say is "WOW"! That is a stunning card. Thank you for another beautiful card. Simple is so great. Anyway, I love your cards and blog. OHHHH What beatiful papers I would have a harf time cutting them up too. Love your pure blossoms you are so inspiring. Thanks for sharing,keep then coming.